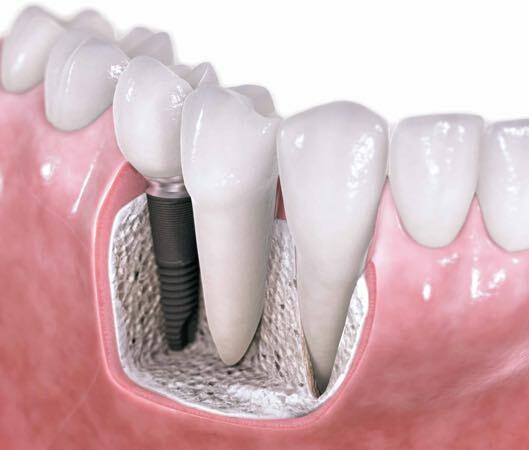 Dental implant solutions for long lasting, aesthetic new teeth. Dental implants are usually titanium fixtures, placed in the jaw to create a secure and lasting foundation for natural looking and feeling replacement teeth. Dental implants work through a process called osseointegration, as bone cells actually attach to the implant surface and accept it as part of the body. Often dental implants are left for a period (eg. 12 weeks) for bone integration to take place before teeth are attached. But in many cases such as cosmetic cases or full mouth replacements, it may be suitable to have immediate teeth attached to the implants, without a waiting period. Dental implants are a permanent solution to treat missing teeth without damaging any adjacent teeth (such as in bridgework). They can also be used to avoid or get rid of loose dentures, for people with many or all missing teeth. If you are missing teeth or have been diagnosed with hopeless teeth, or you believe you are held back by an unattractive smile, then explore the possibilities with us – to embark on a journey towards a new, healthier smile. At All On 4 Clinic Perth, we have a particular expertise in complex reconstructive implant dentistry, including implant replacement of single or multiple missing teeth, implant related bone and gum grafting procedures, and as the name suggests, graft-free All On 4 Dental Implants for immediate full teeth replacement. There are many types of teeth replacement options that would be categorised under dental implant treatments. If you have a single missing tooth or a failing tooth, a single implant tooth can give you a new smile. Dental implants can replace one or several severely diseased or missing teeth, on the foundation of implants, such as 4 teeth replaced by a bridge on 2 implants, or even 4 individual implants, depending on the case requirements. If you have a full set of missing teeth, or hopelessly diseased teeth in general, then full teeth replacement with implants may be indicated. In such a case, one option may be to use implants to stabilise removable dentures for reliability, excellent retention and confidence. Another option would be permanent teeth replacement that is non-removable and involves no dentures or plates, such as our immediate All On 4 method. For so many of our patients who suffer from dentures or have heavily diseased teeth, full implant teeth replacement has given them improved function, a new smile and a renewed self confidence with eating, smiling and socialising. When we assess your situation, we will also look at your gum health and the condition of your jaw bone – it’s shape, position and density for implants in relation to where your new teeth need to be. In cases of jaw bone shrinkage (not enough bone for implants), a bone grafting procedure might be required for conventional dental implants. Modern dentistry techniques and the latest innovations in implantology now allow for many patients, a full teeth replacement without bone grafting, using the All On 4 method. Dental implants: where to start? If you are thinking of a new smile based on dental implants, or want to get rid of removable dentures, contact Complete Implant & Sedation Dentistry – All On 4 Clinic Perth and speak to our friendly team to book an appointment. All On 4 Clinic Perth is led by Dr Misagh Habibi, who performs dental implant surgery and complex implant dentistry procedures on a daily basis. At All On 4 Clinic, you can often “wake up to a new smile” depending on your case requirements, receiving your implants under IV Sedation, with comfort and little to no memory of the process. You know you are in expert hands, with Dr Habibi being qualified with a Master of Oral Implantology and having performed thousands of implant procedures, including many of complex aesthetic and surgical requirements. Most importantly, because we perform a wide range of implant =methods, and stock a wide range of brands and designs, we select solutions carefully tailored to meet your personal case needs. Call us and experience the difference this wide expertise makes for dental implants. Our practice is located in Subiaco, a 2 minute drive from Kings Park in (West) Perth.